There are many ways to enjoy cheese, but this tart gives you the flexibility to choose your favorites. Which ones to use is entirely up to you, but a mixture of three different varieties will offer up a nice mix of flavor and texture. A soft goat, Brie, or blue always adds some punch and saltiness, while an aged cheddar brings gooey, meltiness. 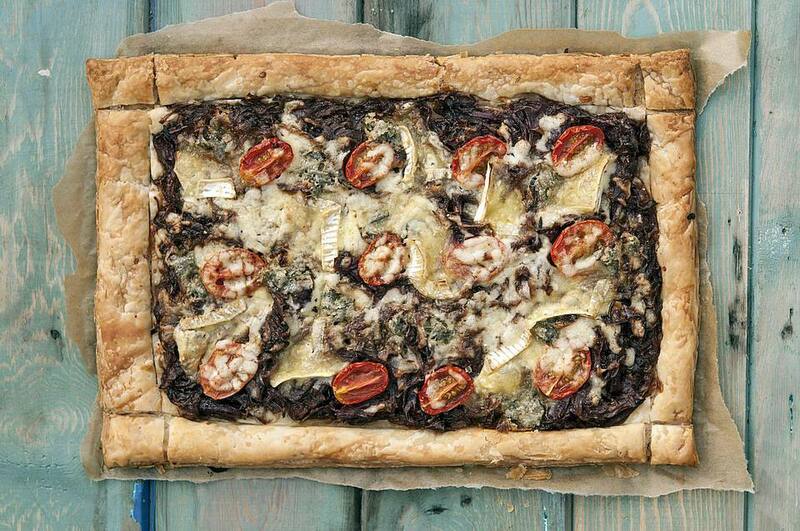 The tart is also a great way to use up leftover cheeses from your cheeseboard. Not only can you change the cheeses to suit your taste, but it's easy to customize with your favorite herbs and even some spices for an aromatic kick. The base of this tart is the much-loved caramelized red onion mixture. It's always a winner, so you may want to make extra filling as it freezes really well. Melt the oil and butter in a large frying pan. Once melted, add the onions, cover and cook very gently for approximately 10 minutes. You are looking to soften the onions, but not brown them. Once the onions are translucent, turn the heat up a fraction, enough to bubble the white wine when added. Keep the wine bubbling until it disappears to a glaze rather than a liquid. At this stage, add the thyme and balsamic glaze if you are using it. Stir well, then put to one side to cool completely. You can make this part of the recipe the day before if you have the time. Once the onions are cool, lightly dust a worktop with plain flour and roll the pastry into a rectangle approx 34 x 24cm. Grease a sheet of baking paper and lay the rectangle on top. Using a sharp knife, lightly score a 4 cm border into the pastry, taking great care to not cut all the way through. Put the pastry into a fridge to rest for 15 minutes. While the pastry is resting, prepare your cheeses. Grate harder cheeses, cut softer ones into small pieces, and crumble the crumbly ones. Try not to make the crumbles too small, it's good to have some larger pieces as small pieces may burn. Preheat the oven to 190 C/375 F/Gas 5. Remove the pastry from the refrigerator, spread the onions carefully within the border, then push the plum tomato halves into the onions. Scatter over your cheeses, and finally, season with salt and pepper. Bake on the middle shelf for 40 minutes or until the pastry is crisp, risen, and golden brown. Serve hot with new potatoes and a mixed salad. The tart is delicious cold for picnics, in a lunch box, or simply as a tasty snack.